As the gears of federal government have ground to a halt, a new energy has been rocking the foundations of our urban centers. From Atlanta to Seattle and points in between, cities have begun seizing the initiative, transforming themselves into laboratories for progressive change. Cities Rising is The Nation’s chronicle of those urban experiments. Cities are where the action is these days. Progressive action, political action. From paid sick days to universal pre-K, fossil-fuel divestment to anti-fracking ordinances, police reform to immigrant rights, the country’s urban centers are leading the way, far outpacing the federal government in vision and action. 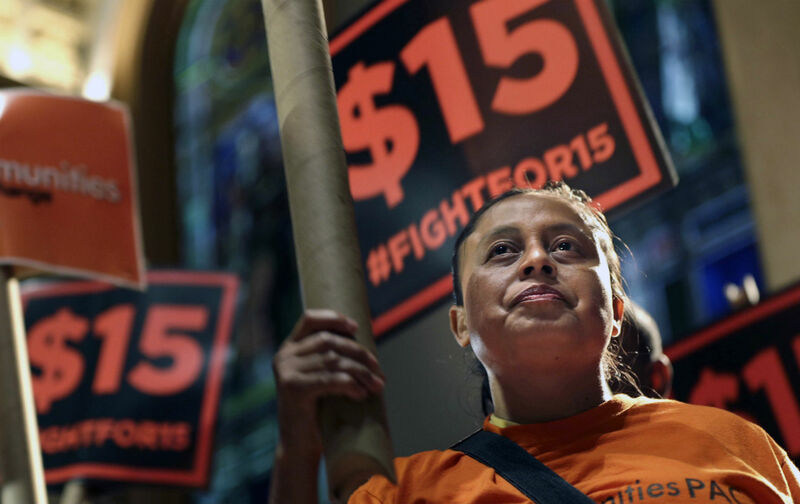 Just look at the growing movement for a $15 minimum wage. While Bernie Sanders has been raising minimum-wage consciousness on the campaign trail—introducing a bill in July to raise the federal minimum to $15 and calling for the same during the first Democratic presidential debate—it was local politicians, with names barely known beyond their districts, who first heeded the call of struggling workers and made $15 a reality. Before Bernie, in other words, there was Nick Licata and Kshama Sawant, Ruth Atkins, and the Emeryville City Council. In recognition of this moment, progressive politicians from cities around the country—Los Angeles, San Francisco, Minneapolis, Denver, Philadelphia, and beyond—have joined forces to begin sharing their strategies for creative progressive change. Calling themselves Local Progress, they swap policy solutions to urgent, ongoing injustices like income inequality and police brutality, share model legislation and provide strategic support for legislative campaigns. Kind of like an urban anti-ALEC. Today, just three years after it was formed, more than 400 elected officials from 40 states are part of the effort. And the victories are beginning to add up—from paid parental leave in Boston to paid sick leave in New York City, socially responsible investing in Seattle to the use of eminent domain in Richmond, California, to slash homeowner debt. Perhaps one of the best ways to describe Local Progress is as a kind of urban anti-ALEC. This week, Local Progress members from all over the country are meeting in Los Angeles for the group’s fourth national gathering. From October 26 through 28, they are trading their best ideas and strategies for building progressive local power—and combatting police violence, spreading the Fight for $15, expanding affordable housing, boosting civic engagement, and pushing the fight for LGBTQ rights beyond marriage equality. Chuy Garcia, who gave Chicago mayor Rahm Emanuel a run for his millions in this year’s election, will be on the scene, as will Minneapolis Mayor Betsy Hodges, SEIU President Mary Kay Henry, AFL-CIO Executive Vice President Tefere Gebre, and dozens of council members, alderman, and supervisors from around the country. If cities are the incubators of promising progressive ideas, this gathering is a bit like the annual science expo. The Nation has asked four Local Progress stalwarts to share some of the policy solutions they’ll be discussing at the gathering. New York City Council members Brad Lander and Antonio Reynoso, San Francisco Supervisor John Avalos, and Chicago Alderman Scott Waguespack all weighed in, offering thoughts on everything from humanizing the sharing economy to organizing for police reform, protecting sanctuary cities, and pushing back against privatization and regressive tax policy. Here’s what they said. Rides from Uber. Home cleaning from Handy. Meals from Seamless. Web design from Upwork. Even doctors from Medicast. There’s no doubt the on-demand economy is convenient. Consumers can arrange for services at the tap of a touchscreen. Workers can choose their hours and earn a little extra cash. But there’s a very dark side to the “sharing” economy: The benefits aren’t usually shared with the workers. Progressive cities are bringing worker protections into the 21st century—and some real sharing into the sharing economy. Working “by-the-gig” rarely provides job security, health insurance, paid sick days or family leave, on-the-job training, or retirement contributions. Workers lack the right to organize a union. And eight in 10 freelance workers report having been cheated out of wages they were owed. President Obama and Democratic presidential candidates are finally talking about the issue. But the Republican Congress will likely block any progress. Marco Rubio recently called for even further deregulation, leaving workers at the mercy of multibillion-dollar corporations. So cities are taking the lead in writing new rules, working with Local Progress, the National Employment Law Project, forward-thinking unions, and worker organizations to level the on-demand playing field. In Seattle, City Council member Mike O’Brien is fighting for a bill that would allow drivers for Uber, Lyft, and other “ridesharing” companies to organize and bargain collectively so that workers have some voice in the terms and conditions of their work. In New York City, we are working with the Freelancers Union to combat wage theft and late payment. When conventional employees are cheated out of wages, the state labor department can enforce and win double damages. The #FreelanceIsntFree campaign (which recently brought its message to the White House) would provide freelancers with similar protection. Council Member Corey Johnson and I are working with the New York City Taxi Workers Alliance to mandate a “driver benefits fund” (funded by a small fare surcharge) to provide for-hire drivers with healthcare benefits—a first step toward the “Shared Security Account” that Nick Hanauer and David Rolf called for in a Democracy Journal article this summer. And we’re amending New York City’s human-rights laws to make clear they apply to independent workers. There is no reason Uber should be able to discriminate against drivers based on race or religion. Meanwhile, from San Francisco to Burlington, cities are establishing offices of labor standards and adopting other innovative approaches (like partnering with community-based organizations) to enforce the laws that protect workers. One task: making sure conventional employees aren’t illegally misclassified as independent workers by employers trying to cheat them out of benefits and protections (a big problem for day laborers and domestic workers). These offices can also make sure that companies who need licenses from the city get and keep them only if they respect local, state, and federal laws. Ultimately, we’ll need national regulation to match the growing on-demand economy. But for now, progressive cities are bringing worker protections into the 21st century—and some real sharing into the sharing economy. Eric Garner. Michael Brown. Tamir Rice. Sandra Bland. For more than a year, the senseless deaths of young black men and women by police officers or in police custody have dominated headlines and helped fuel a movement. Under the banner of Black Lives Matter, this movement has been gaining ground in cities, towns, and counties across the country, spreading the call to end racist policing and begin enacting serious police reform. Its powerful message has reached all the way to the presidential campaign trail and beyond. But as the public waits for progress at the national level, change is already happening at the local level, thanks to powerful alliances between community activists and hundreds of local politicians. In New York City, where I am a City Council member representing neighborhoods in Brooklyn and Queens, there is a desperate need for sensible reforms of the New York City Police Department (NYPD). For all to many New Yorkers, the excessive use of police force is a daily reality. The excessive surveillance of the Muslim community and a racialized stop-and-frisk policy also take their toll. In response, organizations and progressive politicians have been fighting to improve accountability and transparency after years of racial profiling by the NYPD. The work has been supported by a broad coalition called Communities United for Police Reform, which has driven a strategic, multi-year campaign to knock on doors, organize the public, influence the public discourse, and pass legislation to implement smart reforms. Communities want change, and they want to participate in the process of reforming the NYPD. So, working together, we’ve introduced the Right To Know Act as a way to meet their demands. These bills would require NYPD officers not only to identify themselves when stopping civilians but also to explain that the searches are voluntary and may be declined. This is not the first time we have stood up for the people of our community. In 2013 and 2014, in partnership with Communities United for Police Reform, the City Council passed a series of bills known as the Community Safety Act, which together banned racial profiling by police and made it easier for New Yorkers who have experienced profiling to sue NYPD officers. The act also installed an independent inspector general to oversee the actions of the NYPD. Of course, New York City is not the only city in our nation where racial profiling, unjust searches, and incidences of police brutality are common occurrences. Nor is it the only city where coalitions of community leaders and elected officials are working to improve the system. In the last year alone, communities have joined together with progressive local legislators to correct the imbalance of justice. In Los Angeles County, the grassroots organization Dignity and Power Now won a transformative campaign, led by formerly incarcerated people and their families, to establish a strong civilian oversight commission for the sheriff’s department, which has an ugly history of violence against civilians on the streets and in county jails. In Newark, community leaders partnered with Mayor Ras Baraka to create one of strongest civilian complaint review boards in the country, which has both a voice in disciplining police officers and a policy advisory role. As the public waits for police reform at the national level, change is already happening at the local level. And in Minneapolis, a coalition led by Neighborhoods Organizing for Change succeeded in pressing the City Council to repeal spitting and loitering ordinances that were being disproportionately used to harass and harm black and Latino residents. They also won passage of a data-collection law that will begin to collect and publicize important evidence about the police department’s stop-and-frisk and use-of-force practices. Members of Local Progress, partnering with community-based allies, have been central to these fights and many more, and we will continue combating such injustices across the United States, fighting for everyone to be treated equally under the law. In the last few years, hundreds of cities across America have disentangled their police departments and jails from the federal immigrant-deportation machine, refusing to honor the Feds’ requests that cities detain immigrants past their release date so they could be picked up and deported. These policies protect immigrant families from the devastation of deportation and from crime, because they foster better relationships between the police and immigrant communities. The movement has been a bright spot for our country’s immigrant-rights movement. But during the last few months, the policies, and in some cases the very idea, of sanctuary cities has come under attack. The catalyst for these changes was an undocumented immigrant named Juan Francisco Lopez-Sanchez who allegedly shot and killed a young white woman named Kate Steinle. He claims that the shooting was an accident, but her case has become a cause célèbre among opponents of immigrants because Lopez-Sanchez had been deported five times previously, and had recently been released from jail in San Francisco without being turned over to Immigration and Customs Enforcement (ICE). San Francisco’s Due Process for All Ordinance, the latest update to its Sanctuary City policy, bars the sheriff from detaining people past their release date on behalf of ICE’s Secure Communities, or S-Comm, program. The goal of Due Process for All is to protect immigrants and their families from S-Comm, which created an immigration dragnet, deporting tens of thousands of immigrants and tearing their families apart. Due Process for All also enables immigrants to be integrated into San Francisco’s local law-enforcement efforts by promoting relationships between immigrant communities and the police. San Francisco has been at the leading edge of a national movement: across the nation, over 350 other local governments have recently adopted policies limiting collaboration with federal immigration officials. But as a result of the widespread effort of local governments to limit coordination with the S-Comm, the federal government has tweaked and renamed its deportation effort the Priority Enforcement Program (PEP), which calls on local law enforcement to notify Homeland Security of a detainee’s release rather than detaining the individual past his or her release date. Like S-Comm, PEP has the same effect of weakening trust between immigrants and local law enforcement because local law enforcement is seen as an arm of federal immigration efforts. The politics of race, citizen entitlement, and immigration reform have put San Francisco and other cities’ sanctuary-city policies squarely in the cross hairs of conservative extremists and political opportunists. From the highly polarizing presidential campaign of Donald Trump to the calculated posturing of Hillary Clinton (who supports PEP) to the election-year pandering of San Francisco Mayor Ed Lee, eager to blame the policy for Steinle’s death, politicians are scapegoating immigrants and undermining the sanctuary city policies that immigrants rely on for their security. Just last week, the US Senate narrowly failed to pass a Republican-backed bill that threatened to withhold federal grants from sanctuary cities and increase penalties for undocumented immigrants who reenter the United States after deportation. Some cities are already working to resist this pressure. On the same day that Senate Republicans sought to punish sanctuary cities, the San Francisco Board of Supervisors unanimously passed a resolution reaffirming our commitment to the Due Process for All Ordinance and urging our sheriff not to comply with the new PEP program. Local governments must lead the way on protecting immigrants from deportation. Cities around the country should follow suit and adopt a wide array of programs and policies to protect and empower immigrant communities. Like New Haven, they can establish Municipal ID cards to help immigrants navigate daily life; like Chicago, they can ensure that city services are available in multiple languages; like New York, they can provide quality free legal counsel to residents facing deportation; and like Los Angeles, they can conduct outreach programs and offer affordable citizenship preparation courses to help residents naturalize and gain the benefits of citizenship. This moment is a pivotal one for our nation and the many cities that have sought to protect immigrants against deportation. We either succumb to the rightward push of the politics of race and citizen entitlement or we strengthen our efforts to protect and integrate immigrants and their families in recognition and honor of the contributions they make to our society. Local governments must lead our nation forward. The fiscal crisis that’s squeezing cities and towns across this country is perhaps at its most dramatic in Chicago. Our municipal pension systems are woefully underfunded, the result of decades of failure by city and state governments to pay their share. Our schools are facing an enormous fiscal shortfall that could result in the firing of 5,000 teachers in the middle of the year. And we’re witnessing heartbreaking violence in our communities, the result of an overwhelmed police force and neighborhoods mired in economic hardship. Simply put, our city has a cash problem. To his credit, Mayor Rahm Emanuel acknowledged this problem in his recent budget address, railing against the budgeting tricks of previous years and vowing to end the city’s structural deficit. Unfortunately, Mayor Emanuel reached into the same tired bag of tricks in order to solve the problem: regressive tax increases on working families and privatization of public services. These are tricks we’re all too familiar with here in Chicago. We’ve already been through some of the worst privatization deals in the country, and we know full well from our experiences with parking meters and school janitors that it’s been a fiscal boondoggle resulting in higher costs and worse services for taxpayers. And the mayor’s regressive property-tax proposal is just another way to balance budgets by raising taxes on working families who are already struggling to get by. Here’s the good news, though: Chicago is one of the wealthiest cities on the planet. There’s an enormous amount of capital flowing through this city every day. Chicago’s City Council Progressive Caucus, which I chair, has been advocating for common-sense tax ideas to direct some of these dollars toward crucial programs and services, easing the burden on working families without selling off public assets. We’ve advocated for creating a special property-taxing district that covers the skyscrapers in downtown Chicago. Too often, owners of these buildings hire politically connected firms to get enormous discounts on their assessments; a more fair valuation would generate substantial new revenue. We support reforming the billion-dollar mayoral slush fund called “tax-increment financing.” We support fixing the problems in the infamous parking-meter privatization deal. We introduced an amendment that would tax big-box stores for the undue stress they put on our stormwater system, and have called for expanding the sales tax to include luxury services like pet grooming or portfolio management. Rahm Emanuel has proposed regressive tax increases and privatization of public services to solve Chicago's cash crunch, but progressive politicians are pushing back. In short, the Progressive Caucus has progressive revenue ideas that will work for all of Chicago. We’ve convened a series of town hall meetings across the city, drawing crowds of hundreds of concerned neighbors, and have introduced a series of amendments to move this budget in the right direction. As progressive leaders who love this city, our caucus knows we need new revenue to educate our children, care for those in need, and provide growth and opportunity in every community. For our city to prosper, those dollars must come from those who can most afford to pay, not from the pockets of working families. John AvalosTwitterJohn Avalos is a San Francisco Supervisor. He was recently elected the chair of the Local Progress Board of Directors. Antonio ReynosoTwitterAntonio Reynoso is a New York City Council Member. He is co-chair of the Progressive Caucus of the New York City Council and a member of Local Progress. Scott WaguespackTwitterScott Waguespack, a member of Chicago’s City Council, is a member of the Local Progress coalition.